By the half yard The fabric is 100% cotton and new on the bolt. 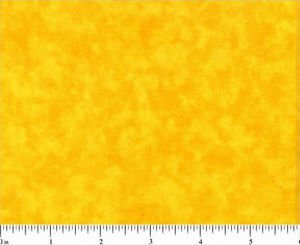 Medium weight Quilt shop fabric available in a variety of colors. This listing is for 44/45 inch wide goods. Carried by Choice Fabrics and Marshall Dry Goods. Printed by Santee Print Works. This color is a nice Dark Gold number 0503We at Hyderhangout: Quilt Fabric & More strive to service all our customers equally. We do have a physical storefront and a real online store besides our eCRATER store. We strive to keep all our items up to date, but with the restraints that eCRATER puts on us about linking our POS at our physical store we cannot humanly keep our inventory 100% in sync. We have to manually update eCRATER inventory. We at times in the store sell and item do not get to manually remove the item from eCRATER when it is sold. It sometimes takes a few hours when something is sold out to remove it from our eCRATER site. We strive to only list items on eCRATER that we can reorder or have lots of items in stock. Very rarely we need and extra two days to get an item back in stock. If you are in a time crunch and need things shipped immediately please pay for priority shipping and/or contact us and let us know. You are welcome to check and see if items are in stock before purchasing. Also, we have five Business days handling time on most of our items. If you order something that you need immediately, please contact us so we can work our schedule to accommodate your need. Our store business hours are Tuesday to Saturday. Also, we do take some holidays off. We ship daily as needed. If you order on Saturday after 5pm through Tuesday at 9 am it may not ship until Tuesday.We will ship priority mail by the same or next business day if you choose and pay for that option. If you order on Sunday and pay for priority mail, we will make a trip into town to the store to ship the item. Please be patient with us. We understand that eCRATER is pushing a culture of instant service and instant shipping, but we are a small business and are not able to compete in that manner.